A patient education programme for people with type 2 diabetes has been introduced across the Northern Health and Social Care Trust. The DESMOND (Diabetes Education and Self Management for Ongoing and Newly Diagnosed) initiative – spearheaded by the Northern Integrated Care Partnerships (ICPs) which recognised the need to tackle the growing numbers diagnosed with diabetes in the region – is a structured programme aimed at providing education and support to patients to help them manage their condition and prevent avoidable complications. There are over 100,000 people living with diabetes in Northern Ireland with approximately 90 per cent living with Type 2 diabetes. It is estimated that there are 12,000 people living with Type 2 diabetes who have not yet been diagnosed. The programme aims to educate those newly diagnosed and those with established Type 2 diabetes with high risk complications. Diabetes is on the increase in Northern Ireland and learning to live with the condition can be challenging. People living with the condition are at risk of developing health problems which can include renal disease, blindness, cardiovascular disease and lower limb amputation. With access to funding, provided by the Northern Local Commissioning Group, the DESMOND programme has been introduced by the ICP, with the Northern Health and Social Care Trust delivering the programme which is based around physical activity and healthy lifestyle changes. Dr Brian Connor, GP lead for Causeway ICP, said the programme is aimed at giving patients the tools to help lead a healthy life. “By offering education and support, it puts the patient in control of their condition, rather than keeping them in fear of it. This initiative highlights how, alongside our local commissioning and Trust colleagues, we can make a real difference to people with diabetes. Caroline Finlay, the Northern Health and Social Care Trust’s DESMOND facilitator, explains the programme, which was developed by researchers from the University of Leicester and is now delivered globally by quality assured educators. “Each course involves a group of 10 patients, who can each bring a guest, being invited to attend a session held at a variety of locations across the Trust. The group is encouraged to learn with and from each other by taking part in group discussion and activities. They discuss personal experiences of being diagnosed with type 2 diabetes and how they have dealt it. “We identify issues and concerns regarding the diagnosis, sometimes from myths they have heard, and before completion of the course we encourage them to set goal plans so that they can manage living with diabetes. This can then be reviewed by the GP or Practice Nurse to encourage their progression. DESMOND’s aim is for the patient to become confident in living well with diabetes, make appropriate food choices and be aware of the benefits of exercise and lifestyle changes. 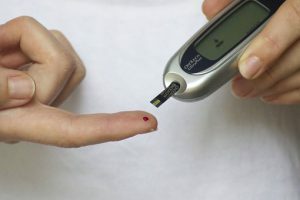 They will gain a better understanding of the potential problems which could arise from poorly controlled diabetes and how best to avoid these,” she said. The programme is delivered over either one full day or two half day sessions at a preferred location of the patient’s choice. There are now plans to offer evening courses for those who aren’t available to attend during the day, and also review courses to re-visit any questions they may have post completion. Mrs Irene Reynolds, from Garvagh, is one of those who have taken part in a Desmond course. Newly diagnosed with diabetes in January 2017, Mrs Reynolds visited her GP after complaining of feeling very tired. “I was so convinced it was an under-active thyroid that when I was diagnosed as diabetic I was very surprised, very shocked and a bit frightened,” she said. After attending the one-day course in Coleraine’s Causeway Hospital, she said it was informative and very educational. With a combination of medication, exercise and watching her diet, Mrs Reynolds now says she has never felt better. “I now feel I’m in control, it’s been a positive outcome for me,” she said. Bride Harkin, commissioning lead from the Northern Local Commissioning Group , said the programme is based on developing strong partnerships with interested groups. “We believe that working with patients through structured education is not only a cost effective approach, but also helps them deal more effectively with their condition and improves health and wellbeing outcomes for them. Desmond courses run on a Tuesday, Wednesday or Thursday each week in the following locations; Whiteabbey, Causeway, Robinson, Moyle, Antrim Area and Mid Ulster Hospitals and Ballymena Health and Care Centre. Anyone interested in attending the course should speak to their GP or healthcare professional who can arrange the necessary referral.